When Annette Gordon-Reed’s groundbreaking study was first published, rumors of Thomas Jefferson’s sexual involvement with his slave Sally Hemings had circulated for two centuries. Among all aspects of Jefferson’s renowned life, it was perhaps the most hotly contested topic. The publication of Thomas Jefferson and Sally Hemings intensified this debate by identifying glaring inconsistencies in many noted scholars’ evaluations of the existing evidence. In this study, Gordon-Reed assembles a fascinating and convincing argument: not that the alleged thirty-eight-year liaison necessarily took place but rather that the evidence for its taking place has been denied a fair hearing. Friends of Jefferson sought to debunk the Hemings story as early as 1800, and most subsequent historians and biographers followed suit, finding the affair unthinkable based upon their view of Jefferson’s life, character, and beliefs. Gordon-Reed responds to these critics by pointing out numerous errors and prejudices in their writings, ranging from inaccurate citations, to impossible time lines, to virtual exclusions of evidence—especially evidence concerning the Hemings family. She demonstrates how these scholars may have been misguided by their own biases and may even have tailored evidence to serve and preserve their opinions of Jefferson. This updated edition of the book also includes an afterword in which the author comments on the DNA study that later confirmed the Jefferson and Hemngs liaison. Possessing both a layperson’s unfettered curiosity and a lawyer’s logical mind, Annette Gordon-Reed writes with a style and compassion that are irresistible. Each chapter revolves around a key figure in the Hemings drama, and the resulting portraits are engrossing and very personal. Gordon-Reed also brings a keen intuitive sense of the psychological complexities of human relationships—relationships that, in the real world, often develop regardless of status or race. The most compelling element of all, however, is her extensive and careful research, which often allows the evidence to speak for itself. 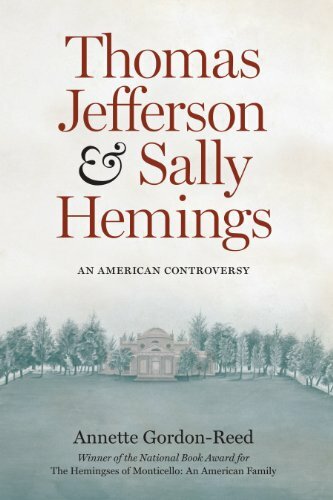 Thomas Jefferson and Sally Hemings: An American Controversy is the definitive look at a centuries-old question that should fascinate general readers and historians alike. This entry was posted	on Thursday, June 9th, 2011 at 20:22Z	and is filed under Books, History, Media Archive, Monographs, Slavery, United States, Virginia. You can follow any responses to this entry through the RSS 2.0 feed. Both comments and pings are currently closed.